by speaking of weather, the season. each a single flare then gone. the image of a burning man. On this day, at 9.15 a.m.
after an act of self-immolation. to a camp for refugees in India. beaten by police and left to die. Back in India, more persecution. grave abuse and cruelty there. and left him on an unlit shore. with work rights in June of that year. They came. They saw. They sank. enter the life of his community. – Scott Morrison, Minister for Immigration and Border Protection; October 2013.
he asks for his organs to be donated. that he can do no other. that will end all torture. to speak of such things? what Leo's sufferings might have been like. A friend rings in the night from England. and dwell inside the cave of stillness. Be aware of each breath; treasure it. You will never have this breath again. had reason, though, to fear the dark. always there inside his room. no sun; the air blank. severe depression, Leo tried to hang himself with a towel. Who, exactly, is ill here? heart murmurs, shadows on a lung. the smallest part of what we possess. It is time to breathe freely, to feel. all will be gone by the Solstice. Tree of fire, tree of blood. their eyes mapping the coast. that presses back on us. 'under the aspect of eternity'. presses back against the light. the skeleton of a golden eagle. curves up to the surface, to breathe. somewhere this side of death. save us from the white crocodiles. into the light beyond light. 'We want to be by our son's side when his funeral takes place. so that they might attend his funeral. who'd sat, unseen by me, at the front. They carry their bodies, their spirits, so quietly. We all wait in the clear winter light. The funeral car starts its slow journey. 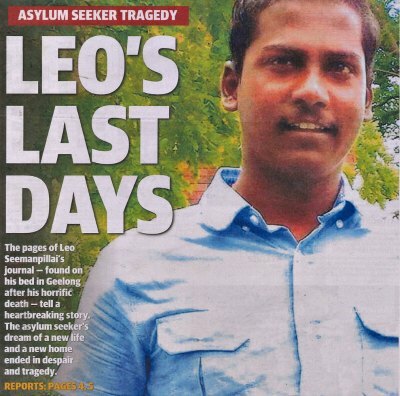 I did not know Leo Seemanpillai while he was alive, but began to know of him after hearing of his death, which occurred on 1 June, the first day of the Australian winter, in 2014. The story of the immense sufferings he had endured, which led him to end his life so tragically, began to unfold in the media. I was deeply affected by Leo's death, as were many others, and wanted to honour his memory. When I mistakenly thought I had missed his funeral, the distress I felt became a spur to writing about him. Visiting Geelong the next day I saw a leaflet about a candlelit vigil – that evening! – in one hour! – Yes! At the vigil I heard many beautiful tributes to Leo. Next day a photograph of myself, holding a candle, appeared in the Geelong Advertiser; the headline above Danny Lannen's report was: 'Geelong Lights Up Night For Leo'. A pattern of connection now, a momentum... I attended a great social gathering of members of the refugee community in Geelong, of which Leo had been a part, then a meeting and a rally on the plight of asylum seekers. The challenge of writing about Leo had taken me away from my creative solitude and out into the streets, churches and halls, to meet many new people and hear their painful or life-giving stories. This rich experience helped me in shaping my personal response to Leo's story. On June 18th, when I went to Leo's funeral, I felt calmly present. After it, I completed 'A Death in Winter'. Diane Fahey's most recent publications, The Wing Collection: New & Selected Poems and The Stone Garden: Poems from Clare, were shortlisted for major poetry awards. A House by the River is forthcoming from Puncher & Wattmann in 2015. Diane has received a grant from the Australia Council to support the writing of a poetry collection set in the west of Ireland. I will be sending this to my local MP and to the Minister for Firm Borders and Closed Hearts. I will be sharing it with my dearest friends and carrying it with me wherever I go so I do not forget. Thank you. A beautiful moving tribute. Thank you Dianne. We really cannot know or understand what moves inside another's heart. We who live in such a privileged country cannot imagine what asylum seekers have seen and suffered. Everyone deserves our respect and understanding. Thank you, Diane. My reaction to the poem is summed up in the saying: "It is better to light one candle than to curse the darkness." Interesting you held one up at the vigil. Who knows where this sort of peaceful mindful protest may lead? It may not soften the hearts of our political leaders but it may well have a cumulative influence on the voters. A beautiful, most moving poem. Thank you so much Dianne for expressing your love and grief in such a tangible way. I would like to share it with The Wordsmiths of Melbourne. So moving and expressive, it gives humanity over policy. Words are an inadequate response to such thoughtfulness. I hope it gets a wide circulation in the community and with all our political leaders. Thank you Diane. What a deeply moving tribute and poignant reflection on a tragedy which should never have happened. May Leo's life and contribution be a legacy which might affect the future responses to those whose lives are affected by such affliction. Sincere condolences and deep peace to those family and friends of his. Dear Diane F: I worked with many immigrants/refugees out of south-east Asia, South America, Eastern Europe/western Asia - before others came from south-west Asia, from Africa - so many shards of darkness for whom Australia represented the light of safety. Why is what is clear to me - a mere citizen - that asylum-seekers rightfully fear their torture/gaol/possible deaths if/when returned by the Immigration Monster Ministers/hand-servant bureaucracatic minions - just doing their job - that there is truth in their fears! What is wrong with our political choices that these figures are damning all of us with their inhumanity and mealy-mouthed responses when tackled on the issues of their inhumanity! Your eulogy, Diane, will enter the ranks of Australian literature - and when people read this 30 or 40 years down the track - then the names of those who took away hope from people such as Leo will be rightfully clothed in shame! She waits for me to get home at night. She meows at the door, and when I return gets under my feet. Sooty has been one of the best things to come into my life. I get entranced by her eyes, and I'm in love with her softness. Now I don't talk to myself, I talk to her. One week, when I was so poor, I spent the last of my money on her, on cat toys and a can of cat food and chicken drumsticks. During the West Indies 1960-61 tour of Australia, Frank Worrell and his predominantly black team transfixed Australians from coast to coast and, without any missionary intent, struck a resounding blow at the White Australia Policy, which was still in place. This jubilant, exciting story prompts questions about today's masses, who enthusiastically support harsh, and arguably racist, treatment of asylum seekers.